As Chief of the Brain Institute Center of Excellence for Novel Approaches to Neurodiagnostics and Therapeutic, Dr. Pasinetti has developed novel drug discovery programs for Alzheimer’s disease. Dr. Pasinetti is leading a primary translational Center to determine whether inventions which appear to work in the preclinical animal model of the disease also show promise in treating patients who have the disease. The Pasinetti lab is utilizing innovative, drug discovery, genomic and proteomic technologies, which offer the promise to shed light on largely unseen details of disease causality, onset, and progression. 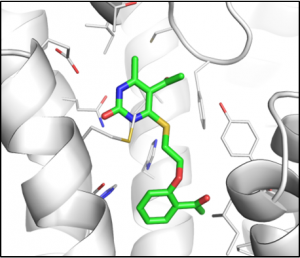 Through the approach of repurposing currently used drugs for other indications, the Pasinetti lab is identifying new therapies that will provide clinical benefits. In recent studies exploring the potential role of repurposing anti-hypertensive drugs for treating Alzheimer’s disease, we found that certain hypertensive agents, including carvedilol, a nonselective alpha1/Beta2 blocker may attenuate β-amyloid (Aβ) oligomerization independent of blood pressure lowering activity. Using structural association relationship (SAR) approaches, we recently identified 220 analogs obtained from compound databases, based on in silico evaluation of anti-Aβ oligomerization, and colloidal activities, as well as assessments of blood brain barrier penetration ability and ADME/toxicity. From these studies, we obtained 5 bioactive lead compounds fitting primary and secondary screening criteria as a starting point for SAR optimization of a novel group of ranked carvedilol anologs characterized by enhanced anti-Aβ oligomerization activity with minimized adrenergic receptor binding activities associated with cardiovascular antihypertensive activities. While clinical studies with carvedilol in Alzheimer’s disease are currently in progress from our group, based on FDA approval, future investigations will test this novel repurposed molecule as a novel treatment for the early stages of prodromal Alzheimer’s disease.